Dhandha, meaning business, is a term often used in common trade parlance in India. But there is no other community that fully embodies what the term stands for than the Gujaratis. Shobha Bondre’s Dhandha is the story of a few such Gujaratis: Jaydev Patel—the New York Life Insurance agent credited with having sold policies worth $2.5 billion so far; Bhimjibhai Patel—one of the country’s biggest diamond merchants and co-founder of the ambitious ‘Diamond Nagar’ in Surat; Dalpatbhai Patel—the motelier who went on to become the mayor of Mansfield County; Mohanbhai Patel—a former Sheriff of Mumbai and the leading manufacturer of aluminium collapsible tubes; and Hersha and Hasu Shah—owners of over a hundred hotels in the US. Travelling across continents—from Mumbai to the United States—in search of their story and the common values that bond them, Dhandha showcases the powerful ambition, incredible capacity for hard work, and the inherent business sense of the Gujaratis. If you've been following my blog since some time, you'd have noticed the astonishingly huge gap between the number of Fiction and Non-Fiction books. I prefer Fiction any time. Although I've now started looking at Non-Fiction as immense sources of useful information too! It might be because of the realization that I'm actually doing an MBA or maybe because I just got some mature-ness in the way I perceive things. In short, it's time for Non-Fiction too. Dhandha seemed to be an ideal choice because one, it was on business and two, it seemed to be interesting! Yes, the cover is okay-ish, not too appealing, but the blurb was intriguing, right? And frankly, I had heard my dad speaking a lot about the business sense of Gujaratis. I wanted to know what it is all about. I've been feeling quite pleased (and inspired) after reading this book. 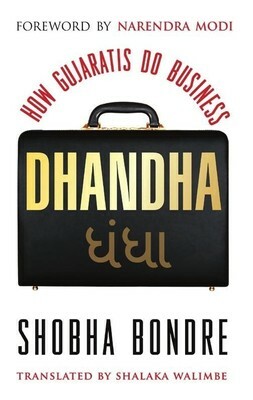 Essentially a compilation of five successful business stories, Dhandha explores the lives and the steps towards success each of them lived through, in great detail. The book is a compilation of five success stories, five businessmen belonging to the Gujarati community from different kinds of personal backgrounds. The underlying force that these people have in common is their business blood. Their amazing sense of finding out opportunities for carrying out businesses and the immense amount of hard work and relentless efforts they put in to see their business reaching the stars! It's amazing to read about their life stories from scratch, how the idea for a business took seed and how it grew. These are definitely not fairy tales. The essence of the book is to highlight the differentiating factor, the thing that distinguishes Gujaratis from the rest of the world when it comes to business and the book beautifully portrays it. The stories are not just about how their businesses grew, but also about the whole family of the businessman and how they helped, the unforeseen events, the troubles and obstacles they faced, the failures, but the best thing in all these stories was the amazing attitude for success and persistence these people showed. For example, Mohanbhai Patel (leading producer of collapsible aluminium tubes in the world) in his story, The Circle of Life talks about how once while experimenting with a new machine tool for producing opthalmic nozzle tubes (used for packing eye ointment) with aluminium (usually tin is used all over the world. This was the first time anyone tried using aluminium), the machine tool broke down and he tried not three, four or five times, but 30 times! That was when it worked! I mean, if the tool keeps on breaking, you'd abandon the idea after maximum ten times, right? It's quite something to try it till you get what you want. Another thing I loved about this whole understanding of their business sense is how they are still so humble and modest. Most of them (four stories out of five are about Patels) have reached immense heights of success, some in India, some based in US, but they've always helped others in many different ways and shared ideas and information. Their decency and humbleness was what I liked best, apart from the infused enthusiasm for "more". The only thing I did not identify well with was how almost all of them have been working hard, all the time, leaving little time for family. In all the cases the whole family was involved. Yes, not forcefully, but still I think it does have an impact on the kind of relationships you have with your kids. The narrative is in first person, mostly from the point of view of the main protagonist of the story. Where there were more people involved, like in some cases there were family members, the story continues from their POVs as well. I found the writing style simple. Sometimes I felt it was too simple for my taste, but that could have been because of translation. I'm not sure. It was still a gripping read, mostly because stories were well structured and written in a way that gives you a neat, step-by-step account of someone's life and business events and milestones and troubles. The stories were definitely super-interesting! I don't have any favorite because I liked all of them for their own USPs. Yep, I'm more inclined towards those with the businessmen who lived and established themselves in India itself. I agree, those who went abroad to the US had a hard time settling down, getting jobs, starting a business, then gradually expanding and ultimately being successful. But I'm more appreciative of those who made use of resources available in India. I absolutely loved the story of Bhimjibhai Patel, a diamond merchant who started from scratch. Literally. He didn’t know languages apart from Gujarati, but he proved that language is no barrier. It’s only the hard work, intense dedication, practical approach, readiness to learn and the inborn enthusiasm to see themselves as successful businessmen that matters. Sign up here to get reviews straight to your inbox! I'm currently not accepting any books for review. TGIF @ GReads # 1!